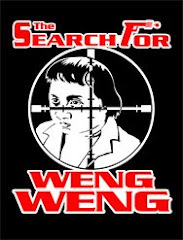 Haunted by memories of Vietnam, war hero Nick Carpenter now patrols the urban jungle of Miami as a detective working for the law enforcement agency of Miami Special Branch. A survivor of the Vietcong torture camps he now fights to keep the streets clean of drug dealers. 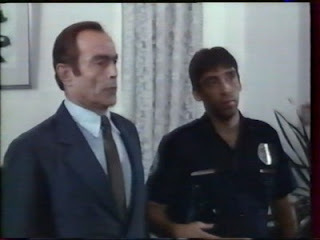 Along with his black police partner Pete Logan he still does things his own way to get results, constantly agitating his superior Chief Inspector John Caruso, played by the ubiquitous Mike Monty. Chief Caruso at one stage applicably verbalises to Carpenter ‘‘You’re a natural born killing machine, and a no good social worker’’. Following tips and hunches Miami’s budget ball breakers Carpenter and Logan are the ‘B’ movie equivalents of Crockett and Tubbs from Miami Vice, with all the attitude of Dirty Harry. They constantly take down other departments jurisdictions against regulation to collar the heavily armed drug dealers. Chief Inspector Caruso has to regularly remind Carpenter that he is no longer in Vietnam and that there are rules to follow ! ‘Fat Cat’ is the new big boss garnering a reputation amongst the dealers and street pushers. Whilst he eases out the opposition Carpenter and Logan squeeze his operation and Fat Cat takes note of Carpenter. His men pick up Carpenter and girlfriend Stella, bringing them blindfolded to their big boss who makes Carpenter an offer of great wealth to join him. Nick Carpenter is an honest cop but Fat Cat gives an ultimatum to work for him, or work for no one! Carpenter is given five days to give the drug baron his answer, holding Stella against her will and making it perfectly clear what the implications of refusal will be ! With his professional partner Pete at his side Nick Carpenter hit’s the streets for information as to Fat Cat’s whereabouts, and together the duo really kick into Action. Revving things up in a red Ford Mustang, Carpenter and Logan shake things down at a bar where a moment to talk with a drink soon turns into a brawl. Gang cronies try to call in a debt but do not cater for the Miami detectives calling out the shots, and pretty soon the two clean house well before last orders are taken. When the governors young son is taken hostage for a $2 million ransom Carpenter and Logan again disregard the chiefs explicit order to stay out of it, and set about closing in on the heavily armed abductors in their own inimitable fashion. Holed up in an abandoned multi storied warehouse the gang of abductors are staked outside by the police but are more than prepared as they strike out with heavy artillery, including machine guns and a rocket launcher. The altercation soon turns into a fire powered frenetic free for all, but amidst the distraction Carpenter and Logan set about taking out the bad guys by surprise from within the warehouse. The Action for value exchange here is very rewarding. All small crimes and drug dealings connect back to Fat Cat, and when Nick and Pete finally catch a guy with inside information as to the crime lords whereabouts the truly Explosive Action kicks into high gear. Employing a personal interpretation on methods of interrogation, used against himself and fellow soldiers in Vietnam, Carpenter employs a makeshift torture device to assure the lackey gives up the hideaway of Fat Cat. It proves to be a small island just off the coast of Miami. Carpenter and Logan waste no time in preparing themselves to go calling! Fat Cat, a Caucasian version of Barry White, with a line in suits likely picked out at the time by Ray Charles, revels in his king pin position and surrounds himself with a small army of well armed men. Nick and Pete are helicopter dropped into the waters just off shore of the island, kitted out mercenary style, armed to the hilt readied for Action. Two cops back in Action ‘Nam style, prepared to take the war to the drug war monger Fat Cat! 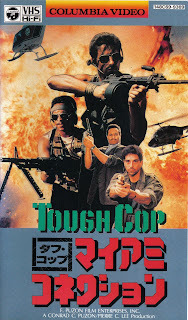 The two super cool cops soon discover that the island is a huge hording port for drugs and munitions. They set explosives to destroy the lot and set about delivering a personal message to Miami’s underworld. Armed with big guns, big explosives and big sunglasses, they storm the island on a mission intent on taking down Fat Cat and rescuing Stella. The bullet laden explosive finale is gung ho greatness, and even has time for the odd moment of welcome wry humour. A nod to Raiders Of The Lost Ark (1981) sees a black clad, sword wielding Ninja, squaring up to Romano Kristoff and a gun. Kristoff’s reaction here, with an immediate response and delivery of dialogue, is classic. This is Action packed, crowd rousing stuff which delivers entertainment in no small measure. How can you not be thrilled by a film that ends with Romano Kristoff audaciously squaring off against a helicopter ?. It takes a lot of bottle to stop Fat Cat getting the cream! Beautiful, uncut print of this rare Filipino-produced film shot in the US. Romano Kristoff is Nick Carpenter, a former Vietnam vet who uses brutal methods to fight crime. Along with his black partner (who likes to...meow!- yes, MEOW!) he goes after Fat Cat (the late Kenneth Peerless of PHANTOM RAIDERS), a ruthless drug lord. 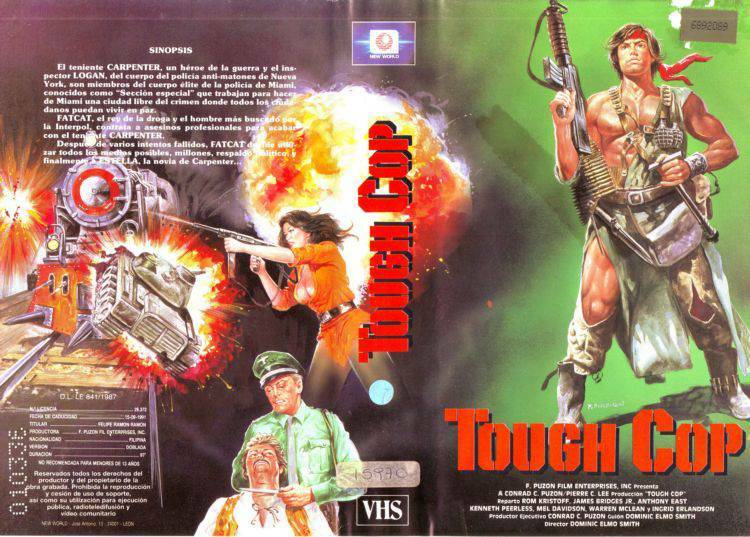 When the fat guy kidnaps Carpenter's girlfriend, Nick puts on his commando outfit once again and gets ready for some serious action! 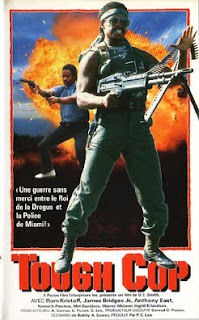 TOUGH COP cleverly switches from cop film to explosive actioner, having shades of MIAMI VICE, COMMANDO and MISSING IN ACTION! Damn, there is even a brief appearance by a ninja! 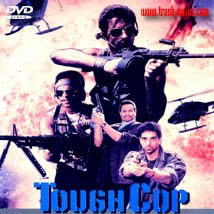 If you enjoy eastern films that desperately try to look American ending up being ultra-cheesy you must try this! They just don't make them so trashy anymore! From the maker of GET THE TERRORIST. does anyone know where to find a copy of this?